Substitute Crewmen on 21 November 1944 mission: 2Lt Stonewall J. Raley (CP-KIA) [See 427th G.C. Newton Crew] for Nally (CP); 2Lt Benjamin F. DuBois (N-KIA) [See 427th S.S. Ackerman Crew] for Tollack (N); T/Sgt D.W. Bourlier (E-KIA) (from 427th BS Charles R. Allen Crew) for Willison (E); S/Sgt Lewis J. McCormick (WG-KIA) [See 427th BS Selwyn D. Flowers Crew] for Grove (WG) who went on to complete his combat tour and Lubbers (WG) who was deleted from the crew when crew was reduced from 10 to 9 men. 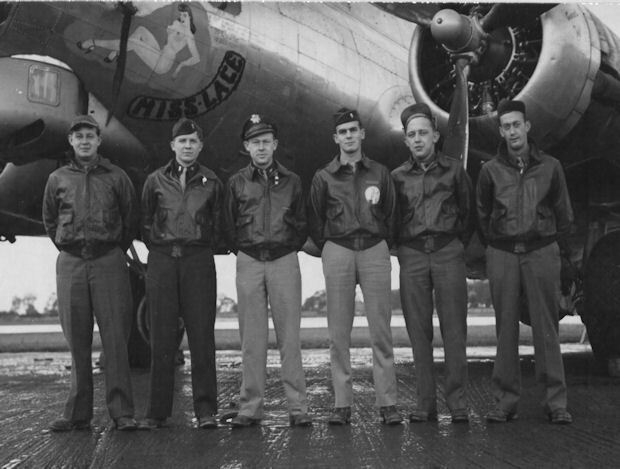 (KIA-POW) - On 21 November 1944 on mission #275 to Merseburg, Germany in B-17G #43-38705 (No name) (360BS) PU-B. Captain Tollack was a Group and Wing Lead Navigator and was not flying with his original crew on 21 November 1944 when, according to the Swiss Red Cross, the Cureton crew were murdered by German civilians, mostly farmers, near Frankleben, Mine-Otte, Tannenburg, about 7KM south west of Merseburg, Germany. According to the Swiss report, three of the Cureton Crew were pitchforked to death, but they only named 2Lt Benjamin F. DuBois (NAV), of the three men. The CoPilot, 2Lt Stonewall Jackson (Red) Raley was hung by farmers. The only survivor, T/Sgt James A. Ellis (R), was blown out of the Radio Room when the Deputy Lead ship exploded. T/Sgt Ellis' back pack chute was open when he regained consciousness. Jim Ellis was badly wounded but had the good fortune to come down near a detachment of Regular Wehrmact troops who rendered first aid, then transferred him to a POW hospital near Leipzig Germany. The bodies of Cureton, Ulrich and Celichowski were exhumed after the war and reburied in the Lorraine American Cemetery, near Moselle, France. The bodies of 2Lt Ben DuBois, 2Lt S.J. (Red) Raley, and Lewis McCormick, were returned to their families in the United States. T/Sgt Jim Ellis recovered and became a member of the 303rd BGA. Jim Ellis passed away a few years ago. 1stLt Carl Ulrich was my best friend, and I worked hard to discover his fate. My wife's cousin who lived in Arlington Virginia, was a professional military researcher, who finally discovered the desired information in the Army Casualty Branch files in Washington D.C.